The Ferrari FXX is an experimental testbed vehicle, built by Ferrari, that was concieved as a way to be able to develop a more user-friendly next generation Ferrari Supercar. It is available for private ownership and uses some technology developed from the Ferrari Enzo and combines it with some all-new developments from Ferrari and some of the suppliers. However, the car is only a part of the overall program: people pay £1.3 million ($2 million usd) but are only allowed to drive the car on special track days approved by Ferrari and after they drive the car they have to brief Ferrari on the car's performance. Michael Schumacher was given one when he retired from Formula One racing at the end of 2006. Ferrari's sister company, Maserati has developed a similar car, the MC12 Corsa. Essentially an evolution of the Enzo, the FXX shares some components with its parent car, but significant portions are exclusive to the FXX. The FXX's engine is based on the Enzo's but has been expanded to 6,262 cc (from 5,988 cc), and output has been boosted from 660PS, as seen in the Enzo, to 800PS (588kW) @ 8,500 rpm. The gearbox incorporates the latest developments from Ferrari's F1 program and has a shift time under 100 ms. The brake pads are upgraded compared to those on the Enzo. It does, however, retain the ceramic discs found on the Enzo. The tires on the FXX are 19 in (483 mm) slicks custom-developed for the car. As with the Enzo, the seat and pedal configuration are custom fit to the user's exact measurements. The FXX features a comprehensive data-monitoring and telemetry that not only allows the driver to improve performance, but also provides Ferrari technicians with valuable data to improve the FXX and future road-going Ferraris. Ferrari has built 29 of these cars, and they have all been sold to preselected past Ferrari customers, including Ferrari's F1 World Champion driver, Michael Schumacher. Michael's FXX differs from others in that it is the only black FXX and comes with red trim on the rims, matte exhaust tips (regular FXX's have chrome tips), number 30 on the doors and his personal insignia on the seats. One car was not sold and is kept by Ferrari. These few customers will not only own a Ferrari FXX, but also participate in further testing and brand development. As the vehicle is not street-legal, owners have the option of storing the car at Ferrari's facilities. As part of the FXX program, the car is maintained by the Ferrari factory. The purpose of this particular program is to allow Ferrari's top customers exclusive access to its most up-to-date technology and to use their input to help develop future models. The FXX was reported to cost 1.5 million euro (excluding taxes), for the car and the services that Ferrari provides with it. 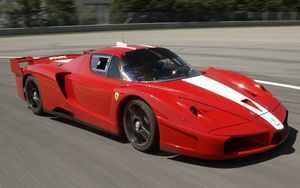 Michael Schumacher owns a Ferrari FXX. It is the only FXX with black paint and does not have a stripe. It was featured in Top Gear. This page was last edited on 16 December 2010, at 08:47.